Tempest was born in Westminster, London[better source needed] and grew up in Brockley, South East London, one of five children. She worked in a record shop from age 14 to 18. She went to Thomas Tallis School, leaving at 16 to study at the BRIT School for Performing Arts and Technology in Croydon, going on to graduate in English Literature from Goldsmiths, University of London. Tempest first performed when she was 16, at open mic nights at Deal Real, a small hip-hop store in Carnaby Street in London's West End. She went on to support acts such as John Cooper Clarke, Billy Bragg and Benjamin Zephaniah. She toured internationally with her band Sound of Rum until they disbanded in 2012 before being commissioned to write her first play, Wasted. In 2013, she released her first poetry book Everything Speaks in its Own Way, a limited edition run on her own imprint, Zingaro. At 26, she launched the theatrical spoken word piece Brand New Ancients at the Battersea Arts Centre (2012), to great critical acclaim. The piece also won Tempest the Herald Angel and The Ted Hughes Prize. Some of Tempest's influences include Samuel Beckett, James Joyce, W B Yeats, William Blake, W H Auden and Wu-Tang Clan. In September 2013, her play Hopelessly Devoted was produced by Paines Plough and premiered at Birmingham Rep Theatre. In 2014 she released the album Everybody Down (Big Dada, Ninja Tune), which was produced by Dan Carey and was nominated for the 2014 Mercury Prize. 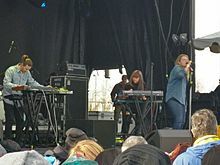 Since the release of Everybody Down, Tempest has increased touring as a musician, playing at festivals and headlining shows with her live band which consists of Kwake Bass on drums, Dan Carey on synths and Hinako Omori on keyboards. In October 2014, her first poetry collection for Picador, Hold Your Own, was published. The collection was a commercial and critical success and its release coincided with Tempest being named a Next Generation Poet. Tempest was elected a Fellow of the Royal Society of Literature in 2015. In April 2016, her debut novel The Bricks That Built The Houses was published by Bloomsbury and was a Sunday Times Bestseller. It won the Books Are My Bag Best Breakthrough Author Award. In September 2016 it was announced that Tempest would curate the 2017 Brighton Festival. She released the album Let Them Eat Chaos on 7 October 2016. It debuted at no. 28 on the UK Albums Chart, and was also released in book format (Picador). The album was also nominated for the Mercury Prize, this time in 2017. She has been nominated for Best British Female Solo Performer at the 2018 Brit Awards. Tempest has received wide critical acclaim for her written and live work. A performance of Brand New Ancients prompted the New York Times to say “As gorgeous streams of words flow out, they conjure a story so vivid its as if you had a state-of- the-art Blu-Ray player stuffed in your brain, projecting image after image that sears itself into your consciousness” while a review by Michiko Kakutani of her poetry collections in the same paper explored her written style “While her intense performances on stage add a fierce urgency to the words, these text versions of her work stand powerfully on their own on the page...using her pictorial imagination to sear specific images into the reader’s mind”. She has been published in nine languages. Everybody Down was nominated for the 2015 Mercury Music Prize and Let Them Eat Chaos have been nominated for the 2017 Mercury Music Prize. Her accompanying poetry book Let Them Eat Chaos was nominated for the Costa Book of the Year in the Poetry Category in 2016. She was nominated as Best Female Solo Performer at the 2018 Brit Awards. In 2013 she won the Ted Hughes Award for her work Brand New Ancients, the first person under the age of 40 to win the award, and was selected as one of the 2014 Next Generation Poets by the Poetry Society. The Bricks That Built the Houses won the 2017 Books Are My Bag Award for Best Breakthrough Author and was a Sunday Times Bestseller. ^ Wroe, Nicholas (4 October 2014). "Kate Tempest: 'Rapping changed my life'". The Guardian. Retrieved 11 October 2014. ^ a b c d Guardian Music (22 October 2014). "'Mercury nominees 2014: Kate Tempest - Music - The Guardian". Retrieved 6 February 2018. ^ Flood, Alison (11 September 2014). "'Next Generation' of 20 hotly-tipped poets announced by Poetry Book Society - Books - The Guardian". Retrieved 6 February 2018. ^ a b Mercury Prize (2 August 2017). "Kate Tempest - 'Let Them Eat Chaos'". Retrieved 6 February 2018. ^ a b Cain, Sian (22 November 2016). "Costa book award 2016 shortlists dominated by female writers - Books - The Guardian". The Guardian. Retrieved 6 February 2018. ^ a b c d "British Female Solo Artist Nominees Announced". The BRIT Awards. Retrieved 6 February 2018. ^ "Results for England & Wales Births 1837-2006". Retrieved 12 November 2018. ^ a b c Mahoney, Elisabeth (27 March 2012). "Wasted – review - Stage - The Guardian". The Guardian. Retrieved 6 February 2018. ^ a b "Books Are My Bag Readers Awards 2017 sponsored by National Book Tokens". National Book Tokens. Retrieved 6 February 2018. ^ a b Isherwood, Charles (14 January 2014). "'Brand New Ancients' Stars Kate Tempest in a Tragic Tale - The New York Times". The New York Times. Retrieved 6 February 2018. ^ Brennan, Clare (23 September 2013). "Hoplessly Devoted - review - Stage - The Guardian". The Guardian. Retrieved 6 February 2018. ^ a b Kakutani, Michiko (18 March 2015). "Review - Kate Tempest, a Young Poet Conjuring Ancient Gods - The New York Times". The New York Times. Retrieved 6 February 2018. ^ Farand, Chloe (23 June 2017). "Kate Tempest 'moves people to tears' with powerful Glastonbury set". independent.co.uk. Retrieved 12 November 2018. ^ Tripney, Natasha (4 May 2017). "Kate Tempest: 'Everything is defined in monetary terms'". thestage.co.uk. Retrieved 19 June 2018. ^ "Let Them Eat Chaos Kate Tempest06.10. Tempelhof Hangar 5". volksbuehne.berlin. Retrieved 19 June 2018. ^ "Kate Tempest". The Royal Society of Literature. Retrieved 26 April 2018. ^ Clark, Alex (9 October 2016). 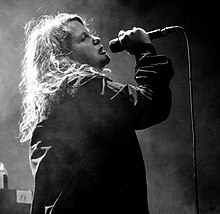 "Kate Tempest: Let Them Eat Chaos review – a state-of-the-world address". The Guardian. ISSN 0261-3077. Retrieved 20 October 2016. ^ "2017:The Year of the Wolf". Press Reader. 19 October 2016. ^ Alexis Petridis (27 July 2017). "2017 Mercury shortlist fails to spotlight truly exciting British music". The Guardian. ^ "William Shakespeare: A digital reinvention". The Economist. 28 August 2012. Retrieved 15 September 2012. ^ Gardner, Lyn (10 September 2012). "Brand New Ancients – review BAC, London". The Guardian. Retrieved 15 September 2012. ^ Michael Hogan (14 September 2014). "Kate Tempest: a winning wielder of words". The Guardian. ^ Alison Flood (11 September 2014). "'Next Generation' of 20 hotly-tipped poets announced by Poetry Book Society". The Guardian. ^ "Kate Tempest shortlisted for Mercury Prize 2017". Pan Macmillan. "Writing your own protest song", The Guardian Teacher Network.